The MediaCAST ViewerTM is a small-form factor, Intel x86 hardware-based set top decoder. It is used with the Kiosk Central add-on module to playback streaming video, audio and other digital media content over the Ethernet/IP network. It decodes and plays content originating from the digital library and digital IPTV channels for output to displays. The Viewer supports a wide range of displays including TVs, LCDs, projectors and plasma screens. The MediaCAST platform interface allows for complete control of media playback on Viewer displays. A hand-held remote or wireless mouse and keyboard can be used for on-screen menu navigation and digital library access. 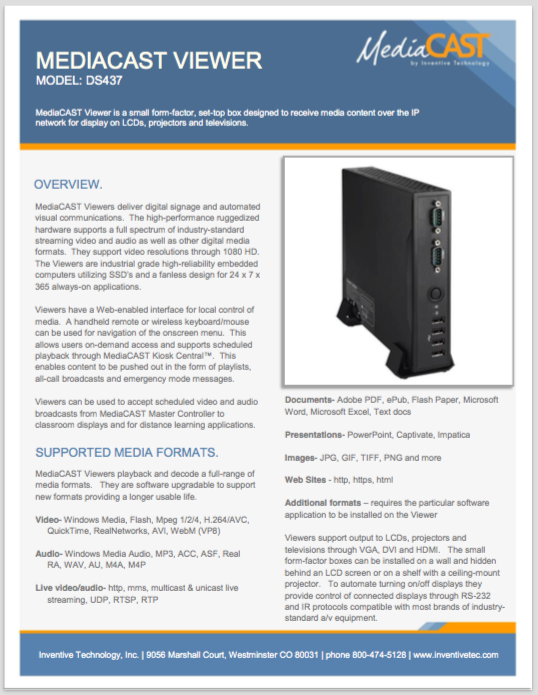 One significant advantage of the MediaCAST Viewer over traditional set tops is its ability to support the playback of a wide-range of digital media and electric content file formats. See tab below for a sample list of supported formats. Together, the MediaCAST Viewer and Kiosk Central create a scalable digital signage solution, perfect for any size organization.